Over the past several decades, linguistic theorizing of tense, aspect, and mood (TAM), along with an intensely growing body of crosslinguistic studies, have revealed complexity in the data that challenges traditional distinctions and treatments of these categories. Mood, Aspect, Modality Revisited argues that it's time to revisit our conventional assumptions, and reconsider our foundational questions: What exactly is a linguistic category? What kinds of categories do labels such as "subjunctive," "imperative," "future," and "modality" truly refer to? In short, how categorical are categories? Current literature assumes a straightforward link between grammatical category and semantic function, and descriptions of well-studied languages have cultivated a sense of predictability in patterns over time. 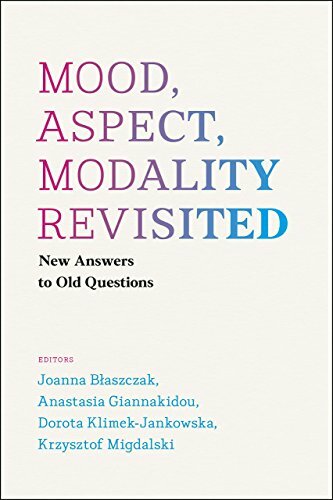 As the editors and contributors of Mood, Aspect, Modality Revisited prove, however, this predictability and stability vanish in the study of lesser-known patterns and languages. The ten provocative essays gathered here present fascinating cutting-edge research that demonstrates that the traditional grammatical distinctions are ultimately fluid and perhaps even illusory. Developing groundbreaking and highly original theories, contributors in this volume seek out to unravel more general, fundamental principles of TAM that can help us better understand the nature of linguistic representations. Joanna Blaszczak is professor at the Institute of English Studies at University of Wroclaw, Poland. Anastasia Giannakidou is professor of linguistics at the University of Chicago. Dorota Klimek-Jankowska is assistant professor at the Institute of English Studies at the University of Wroclaw, Poland. Krzysztof Migdalski is assistant professor at the Institute of English Studies at the University of Wroclaw, Poland.